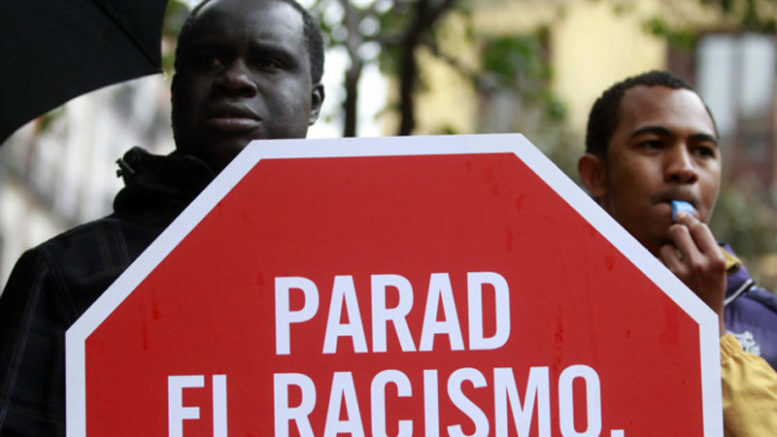 A federation of non-governmental associations that track and denounce racist incidences and practices across Spain has said the persistence of racist behavior and discriminatory practices around the country during 2015 included particularly prevalent incidents involving racist aggression toward neighbors, as well as institutionalized racism in certain government sectors and racist treatment at the hands of some police and law enforcement agencies. The organisation Federación SOS Racismo said that while the incidence of racist behavior and incidents documented during 2015 by its member associations fell by nearly a third from the 330 cases in 2014, the federation nevertheless detected and brought to the attention of authorities 247 cases of racism across Spain last year, 96 of which can be classified as “hate crimes” under Spanish law. Separately, the organisation said, the Spanish Interior Ministry received 1,300 similar complaints of racist incidents during 2015. The incidents of racism monitored by Federación SOS Racismo in 2015 included 112 in Aragón, 80 in Catalonia, 19 in the Basque Country, 18 in Madrid, 12 in Navarra and six in Galicia. The organisation said that among the people most vulnerable to racist treatment and aggression in Spain are Sub-Saharan African immigrants, many of whom are undocumented or whose migratory status is in the process of being regularised by Spanish authorities.